RE: Live or realtime winds? You can see the wind and other data as reported by weather stations. Clicking the labels on the map, you can even find some historical data. Hope it helps! 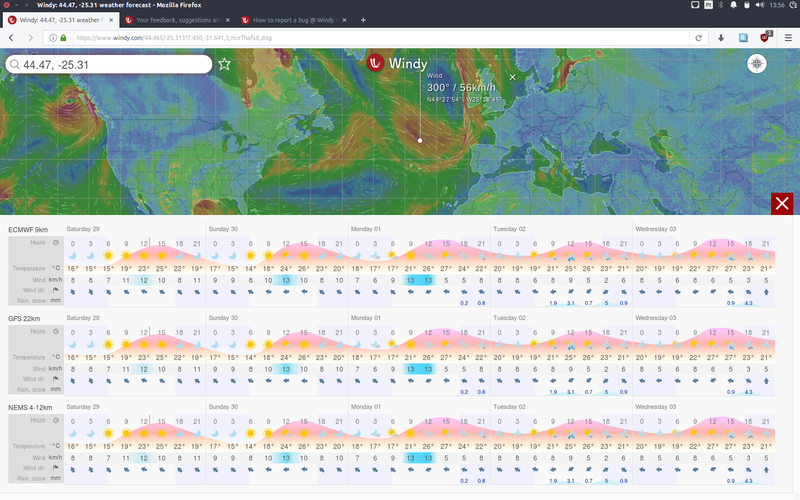 When using the 'Compare forecasts' feature, all three models look exactly the same. All three models show ECMWF, but it only happens when using the 'Compare forecasts' feature. If you look at each model individually, they show different results. I tried using the Android app and the same thing happens. I'am currently using Firefox 53 and Ubuntu 16.04.2. If you need more information, just ask me for it. Hi there! To find that information, click the 'Menu' button, on the upper right corner of the screen, and then 'About these data'. First of all I'd like to thank you for the great web site, it works really well and is very useful. When using the 'wind' overlay, for example, once I start zooming in, the colors suddenly change. I mean, they are in a blueish like color, but from one point of zooming on, they get reddish like. I tested it in various parts of the world and saw the same effect. I did not test all possible overlays, but it happened to me with the wind, wind gusts and temperature options. As already pointed out by @ivo, the app performance is decreased, and sometimes it gets really slow for rendering or moving the globe. I Hope it gets smoother as the software develops. Anyway, the app is great and I will keep using it frequently, whenever I see a bug, I will surely report it.